Please ensure you are familiar with the base access procedures. For more information click here. From St. Louis (East) - Drive west bound on I-70 about 4 miles, go south on 270 approximately 15 miles, drive west on I-44. Drive west bound on I-44 about 135 miles. Exit interstate on 161. At the stop light turn left onto Missouri Avenue. Drive approximately 3 miles at the end of the public road will be the Fort Leonard Wood Main gate. From Springfield (West) - Drive Northeast on West Kearney, turn left onto US-160 Northwest Bypass and merge eastbound onto I-44. Drive approximately 86 miles west towards St. Louis. Exit on 161 and make a right onto Missouri Avenue at the stop light. Drive approximately 3 miles at the end of the public road will be the Fort Leonard Wood Main gate. Once on Base, drive straight through the gate, turn on right on Kansas, and turn left on Iowa. You will see the Nutter Field House on the left. 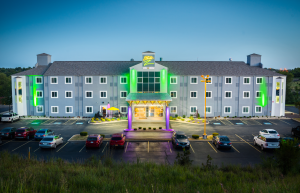 From I-44, take exit 161, turn south on Missouri Avenue and turn left on Z Highway, the hotel is down the hill located on your right side. 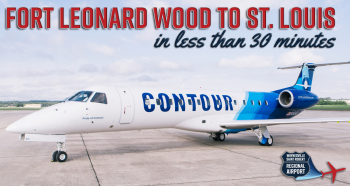 Flying directly to Fort Leonard Wood with rental vehicle capabilities is now an easy option. 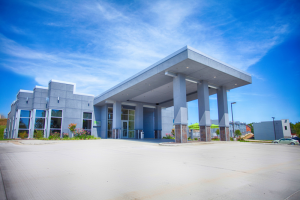 The Waynesville-St. Robert Regional Airport (WSRA)located on Fort Leonard Wood offers jet service between Fort Leonard Wood and St. Louis. Jet service is provided by Contour Airlines. The flight takes less than 30 minutes. Tickets start at $39 each way. The WSRA terminal provides a Hertz rental car kiosk.